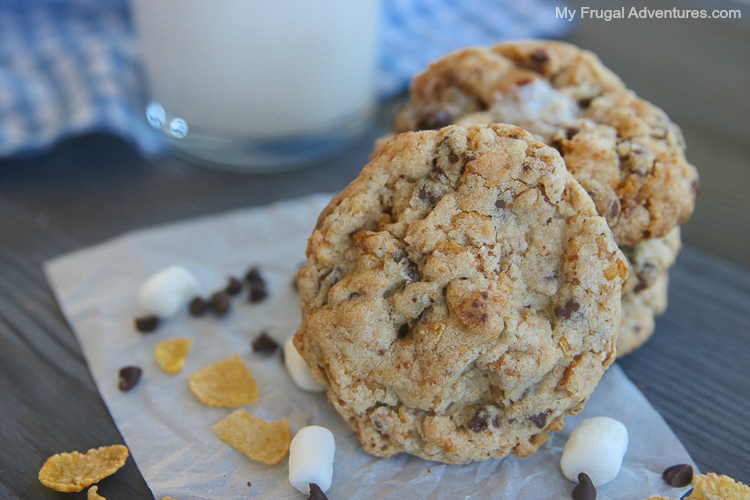 Ever need a chocolate chip cookie but not your basic chocolate chip cookie? Something just a little different? 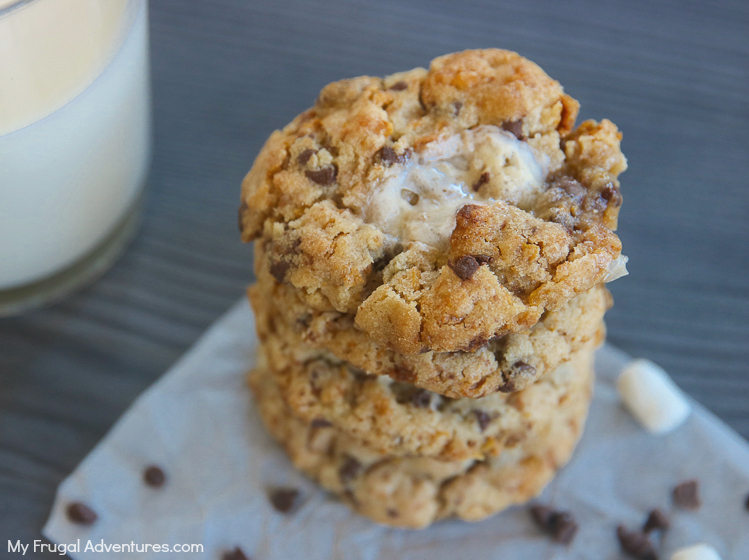 Well hello Milk Bar crazy cornflake cookies! 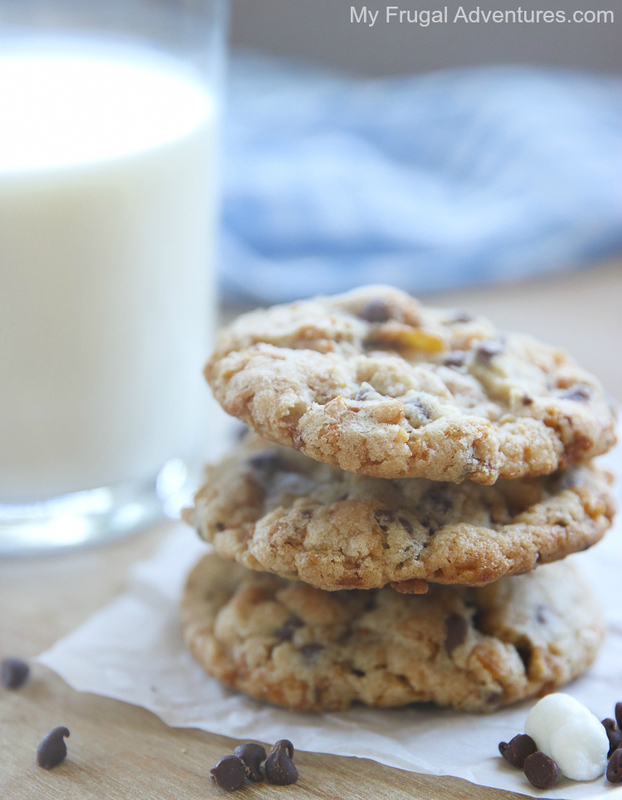 Goodness these are good and just wait until you try the cornflake mixture in these cookies. Addicting! I have wanted to visit Momofuku’s Milk Bar for years now. 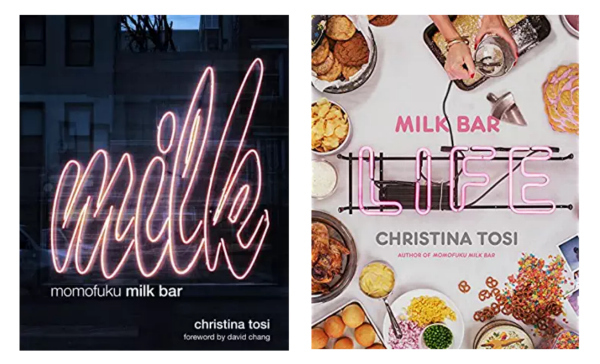 Milk Bar is a bakery that started in New York and has exploded in popularity to cookbooks, bakeries around North America, a line of products in Target… all based on the unique and interesting recipes of Christina Tosi. Since I haven’t been able to visit a Milk Bar location (yet! ), I can still experiment with the recipes at home. So here is a really fun and interesting cookie that I love from the Milk Bar. I have a few changes to the cookie that I prefer to the original recipe, but I thought I’d share this one with you in case you have a sudden need for a unique chocolate chip cookie too. 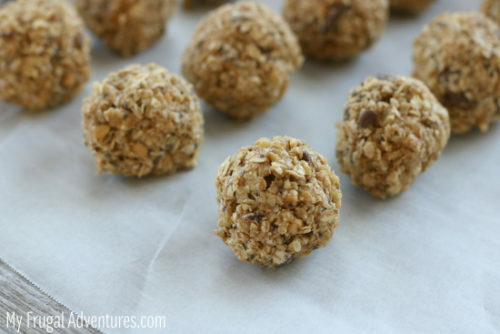 These are pretty simple to make but you do have the extra step of making the cornflake crunch to add in, it is quick to whip up though and I have made Cornflake crunch the day before and just stored it overnight to add to the cookies with great success. Christina Tosi’s recipes are incredibly unique and do require following each step pretty carefully to get the best results. Start by making the cornflake crunch. Add milk powder, sugar and salt and gently toss to combine. Add butter and stir- you should have clusters with all the ingredients together. Spread on a baking sheet and bake for 20 minutes*. Be very careful not to burn! *I baked 11 minutes only so watch your oven time carefully, mine was much lower than the original recipe. Remove from oven and set aside to add to cookies later. Cream together sugar and butter for 2 minutes in a stand mixer on medium. Scrape down sides of bowl and add vanilla and egg. Next add dry ingredients- flour, salt, baking soda and baking powder. Mix just until ingredients are incorporated - about 1 minute on low. Continue with mixer on low and add cornflake crunch and chocolate chips. Line baking sheet with parchment and scoop the dough out- the original recipe calls for a ⅓ measuring cup to scoop the dough. I used a standard cookie scoop. Pat cookie dough down and wrap with saran wrap and chill in fridge for at least one hour. Once dough is chilled, bake in 375 degree oven for about 18 minutes. So that may seem like a lot of steps but really these cookies are very easy to put together and the cornflake crunch is interesting and I thought it was a really fun variation on a standard cookie. I have never had great luck with marshmallows in cookies, so I actually prefer to omit the marshmallows. 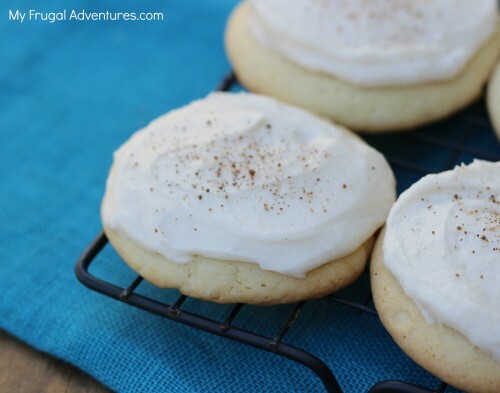 You can add them as she does in the dough or add them individually to each cookie before baking. Another quick note is that these cookies are intended to be large, crispy cookies like a bakery might sell. I prefer smaller cookies (hence the standard cookie scoop) and I prefer softer chocolate chip cookies so I actually slightly underbake mine and allow them to cool on the baking sheet. If you decide to try these out, please come back and let me know what you think! 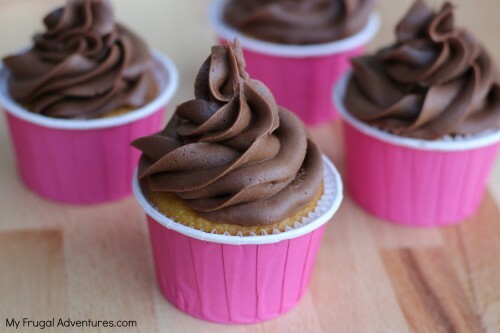 Chocolate Frosting– seriously the best ever! I actually had it on hand for another recipe and I remember Target did not have it but I think I got it at Safeway. I believe Walmart might have it too. Don’t skip this ingredient though it really adds a very unique flavor to the cookies. HTH! The cookies look awesome. I was just wondering if we’re supposed to use all of the cornflake crunch in one batch of the cookies? 5 cups seems like a lot to add to the dough. I can’t wait to make these!